To scale up the lane-detection algorithm to handle more video, it first needs to be published as a Docker image for easy deployment to cloud environments. 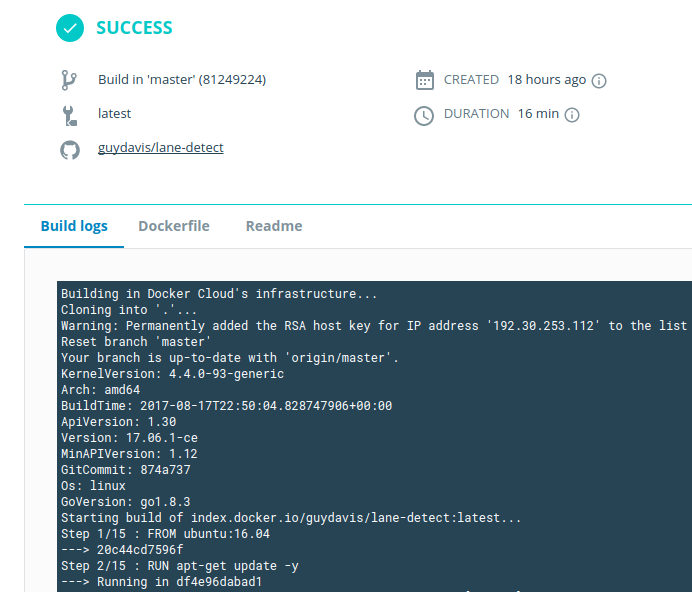 This post covers bundling a Python microservice by building it on Docker Cloud from its repo on Github. RUN python3 -c "import imageio; imageio.plugins.ffmpeg.download()"
docker build -t guydavis/lane-detect . Moving the lane detection algorithm to a Docker image makes for a repeatable and immutable deployment. By encapsulating the various Python, OpenCV, and Imagemagick libraries the entire package is more portable now. Now that the lane detection algorithm is containerized, I’ll next deploy it to cloud providers to process more video in a cluster of workers. Running on Microsoft Cloud - scaling on Azure.